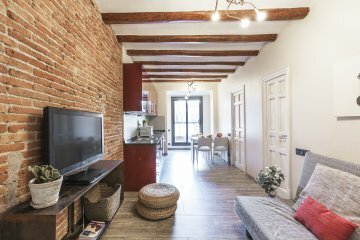 Penthouse dream in the heart of Sant Antoni. Awesome one bedroom holiday apartments for rent in Barcelona with private sunny roof terrace. Very stylish renovation with tiles on the floor, beams on the ceiling and elegant furniture in every room. The living room and bedroom are both very quiet and have lots of light. The sofa in the living room is a comfrotable sofa bed, the small kitchen has views over the terrace and all equipment necessary for cooking a delicious meal. Spacious and romantic bedroom with cosy sidelamps, comfortable queen size bed and closet. There is air conditioning and Wifi all around the apartment, private bathroom with large shower and hairdryer. Plus, the building is also been renovated maintaining the old style and has elevator and security.